HSDC Maps app provides updates on flooding around Hanoi and suggests alternative routes. The Hanoi Sewerage and Drainage Limited Company has developed an app for smartphones called HSDC Maps to help users make updates on rainy and flooded areas throughout the city. It's expected to provide useful information for people living in Hanoi, especially during the rainy season in July and August. Using maps and cameras installed in the city, the app updates detailed statistics on rainfall and flooded areas and recommends alternative transportation routes. It also allows users to see images of the flooded locations so they can see the water level and the traffic situation more clearly. On the app's interface, the red “clouds” shown on the screen are the rainy and flooded places while the green and blue ones show that there's no rain or flooding. Users can also share flood warnings, information, and pictures of flood locations. The HSDC Maps app is available for both IOS and Android devices. Information about the flood locations is also posted on the official website of the company at http://thoatnuochanoi.vn. 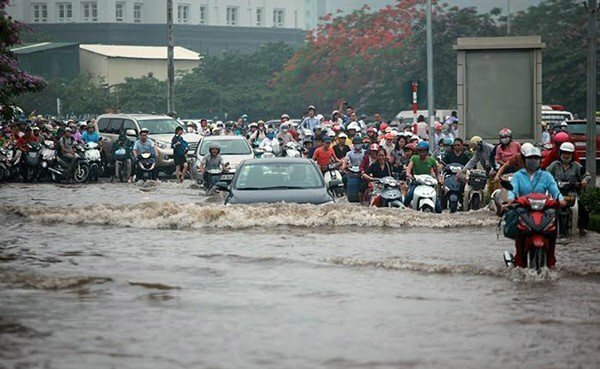 With 50-100mm of rainfall that lasts for around two hours, Hanoi's drainage system tends to overload causing floods in many places, according to the Hanoi Sewerage and Drainage Limited Company. They've been making an effort to manage and upgrade the drainage system to deal with the heavy rains. Last year, a similar app called UDI Maps was launched for Android users in Ho Chi Minh City and has been effective so far.